In an exclusive interview with Dawn.com, Taliban spokesman Zabiullah Mujahid has said that if the Taliban do end up having a say in the Afghan polity one day, they will approach Pakistan "as a brother and a neighbour", seeking "comprehensive ties based on mutual respect, just as we seek such relations with all other neighbours." He acknowledged that Pakistan had remained "the most important hub" for Afghan refugees during the Soviet invasion, and that it was even considered a "second home" by Afghans. Speaking to Dawn.com, Mujahid also outlined the motivation for talks with the US, the conditions in which they are prepared to negotiate and their vision for a new political order, while insisting that the Taliban are holding talks with the United States "on their own initiative". Responding to a question regarding the timing of the talks, Mujahid explained that, even prior to the US invasion, the Taliban had asked Washington to engage in dialogue instead of war. He added that they had eventually even opened a political office in Doha in 2013 for this purpose, but Washington had been unwilling to negotiate at the time. On a question regarding Pakistan's role in bringing the Taliban to the negotiating table, Mujahid said: "There is no role being played by any outside country. This has always been our own initiative and policy." Mujahid said that the Taliban would have an "important role" in the new political order in Afghanistan, but declined to elaborate "before the right time". "When we say we want an inclusive political system, we mean that the [future] government will represent all ethnicities of Afghanistan," he said, adding: "All will serve in it, and all will look [after the country's affairs] themselves without any arguments". The spokesperson said that while the Taliban do not have a codified manifesto, their "clear" objectives were the end of the occupation of Afghanistan, establishment of an Islamic government, establishment of peace and security, reconstruction of Afghanistan and the provision of administrative services. Mujahid said that, "without a doubt," the constitution of the incumbent Kabul administration "was drafted under the occupation of and interests of America". "No country would ever accept a constitution drafted and imposed upon them while they were being bombed," he said. "Our society is nearly 100 per cent Muslim: our constitution will be drafted for us and implemented in light of the teachings of [the] Shariah." As per the spokesman, when the Taliban create their 'Islamic government', they will make the "required" changes and "correct" those stipulations in the Afghan constitution "which are in violation of the Shariah". He said that once complete independence is attained by Afghanistan, scholars from within the society will be gathered and the "current errors" in the constitution would be highlighted and rectified. "I cannot point out all the specifics because such work needs the analysis and research of qualified scholars. Following [their analysis] all errors will be made known." 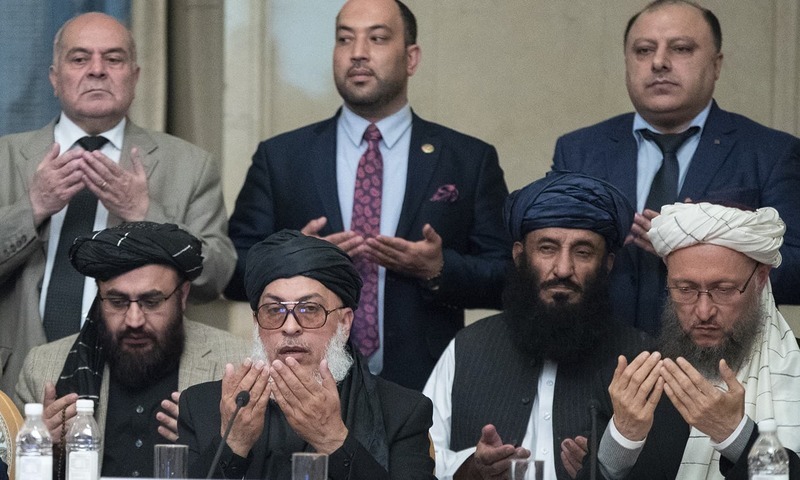 Responding to a question regarding the possible formation of an interim government in Afghanistan, the Taliban spokesperson said that they had neither held any discussions regarding an interim government nor had they proposed such an idea. Mujahid said that the society envisioned by the Taliban was "an Islamic society" and they wanted to prepare a framework of rights "that do not violate Islamic principles [...] [and are accorded] to all male and female members of society." "Our nation has sacrificed two million people for this great objective; however, the problems of the past being alluded to are not all based on reality but are mostly based on propaganda," the spokesperson said in reference to the concerns of Afghan women and rights groups who fear a return of the same restrictions that women had faced some 20 years ago when the Taliban were in power in the country. "Whatever problems that did exist at the time were either because we were in the very early stages [of forming our political ideology], or because it was the need of that time given the preceding war and corruption and the need for serious reform." He acknowledged that the situation today was different. "The intellectual capacity of people has expanded and a lot of experiences have been gained; hence there shall be no problems in affording women and men all their rights in the future," he said. The Taliban spokesperson said that while they were holding talks with the US in Doha, they had not yet reached any conclusion that would entail an immediate end to hostilities against the US and its domestic supporters. He added that, even in Moscow, nothing concrete was achieved that would compel them to end the war and military pressure. "We are forced to wage war. Our enemies are attacking us; therefore, we are also combating them," he said. Explaining the Taliban position on refusing to talk to Kabul, Mujahid said that any talks with the Ghani regime would have symbolic ramifications. He said that if the Taliban were to hold talks with the Kabul government, it would mean that they had "accepted this stooge regime as a legitimate government [even though it was] imposed upon us by aircraft and [the] bombing of invaders". He explained that this would entail an acknowledgement that the Taliban were, in fact, "rebels" rather than a legitimate second power. "But in the condition where no one accepts the imposed government, all agreements reached between the Afghan people and our Mujahideen will be binding [as a pact between equals]," he added. "The shadow of occupation lingers over everything: decision-making power is with the invaders, while our leaders are attacked and bombed," he said. He insisted that under such conditions, they do not see an opportunity for intra-Afghan dialogue and ceasefire. Responding to a question regarding the Taliban's previous support to and protection of the Al Qaeda leadership, which led to the 2001 invasion of Afghanistan, Mujahid acknowledged that: "The Islamic Emirate sheltered those foreign Mujahideen [Al Qaeda operatives] that had arrived in Afghanistan during the period of jihad against the Soviet Union and remained behind as [an] inheritance. Their protection was a religious and cultural necessity." However, he added that currently there was "no one that needed [the Taliban's] shelter", and stated that "the Islamic Emirate shall never allow anyone to harm others from our soil."